"The Mandelbrot set is indeed one of the most astonishing discoveries in the entire history of mathematics. Who could have dreamed that such an incredibly simple equation could have generated images of literally infinite complexity?" -- Arthur C. Clark -- Fractals -- the Color of Infinity. 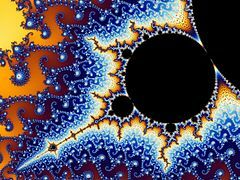 Clarke also notes an "odd coincidence:" "the name Mandelbrot, and the word "mandala"—for a religious symbol—which I'm sure is a pure coincidence, but indeed the Mandelbrot set does seem to contain an enormous number of mandalas." 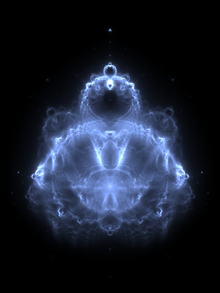 Besides the aesthetic value of such figures, Mandelbrot had much more universal applications for his work. 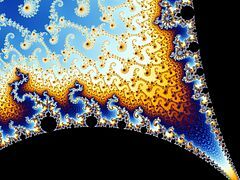 Mandelbrot created the first-ever "theory of roughness", and he saw "roughness" in the shapes of mountains, coastlines and river basins; the structures of plants, blood vessels and lungs; the clustering of galaxies. His personal quest was to create some mathematical formula to measure the overall "roughness" of such objects in nature. 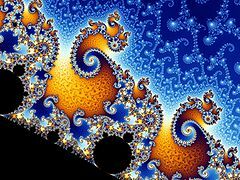 Fractals are also found in human pursuits, such as music, painting, architecture, and stock market prices. 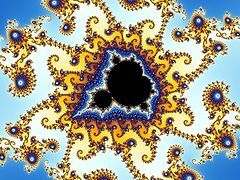 Mandelbrot believed that fractals, far from being unnatural, were in many ways more intuitive and natural than the artificially smooth objects of traditional Euclidean geometry. "In the early 1960s, French mathematician Benoit Mandelbrot carried out a landmark study of such changes in the prices of cotton, and found that the statistics of large market returns follow an inverse power law very much like the Gutenberg-Richter law. In the simplest of terms, bigger fluctuations are more rare than small fluctuations, following almost exactly the same mathematics as earthquakes. Mandelbrot was able to analyze only a few thousand data points, yet he was on to something. "Think of sand running from the top of an hourglass to the bottom. Grain by grain, the sand accumulates. Eventually, the growing pile reaches a point where it is so unstable that the next grain to fall may cause it to collapse in an avalanche. When a collapse occurs, the base widens, and the sand starts to pile up again — until the mound once again hits the critical point and founders. It is through this series of avalanches of various sizes that the sand pile — a complex system of millions of tiny elements — maintains overall stability. In a 1996 book, “How Nature Works,” Bak extended the concept beyond simple sand piles to other complex systems: earthquakes, financial markets, traffic jams, biological evolution, the distribution of galaxies in the universe, and the human brain. "For each great event, they can identify some standout grain that touched it off, and perhaps a few others that kept it going at crucial stages. And these grains, they might conclude, are the real agents of history. Our historian might be tempted to agree, and yet, after such a long career, he may have learned a few things. As a subtle observer of individual character, he will have noticed that in his world every grain is identical to every other, so there really can be no question of any one being a “great grain.” As a result, he realizes that whatever the psychological pull to identify great events with great grains, the idea is a mistake. Only by understanding that his pile is always on the edge of radical change can he resist this temptation. If he does his job well, our historian comes to understand that there are always places in the pile at which the falling of a single grain can trigger world-changing effects. These grains are only special, however, because they happened to fall in the right place at the right time. In a critical world, there are necessarily a few great roles, and some grains by necessity fall into them. Might the same be true of human history? There is no denying that some people, by virtue of their personality or intelligence, are more influential than others. And yet it is at the very least a theoretical possibility that our world lives in something very much like a critical state. In such a world, even if human beings were identical in their abilities, a few would nevertheless find themselves in situations in which their ordinary actions would have truly staggering consequences. They may not even be aware of it, as the potential for their actions to propagate may become apparent only as history unfolds. Such individuals may come to be known as great men or great women, as creators of vast social movements of tremendous import. Many of them may indeed be exceptional. But this need not imply that their greatness accounts for that of the events they sparked off. Just as it is almost irresistibly tempting to seek great causes behind the great earthquakes or the great mass extinctions, it is also tempting to see great persons behind the great events in history. But the sandpile historian comes down firmly against the “great grain” theory of history, and would counsel his colleagues in the human world to follow his lead. He might agree with Georg Wilhelm Friedrich Hegel, who concluded that the great man of the age is the one who can put into words the will of his age, tell his age what its will is, and accomplish it. What he does is the heart and essence of his age; he actualizes his age. In this view, the greatness of an event is not traceable to an equivalent greatness existing in some individual. Rather, what makes an individual notable and “great” is his or her ability to unleash pent-up forces—the will of an age—and so enable those immeasurably greater forces to have their effect. In the context of science, Einstein was a genius of the first order. Because of his genius, he could draw the implications of Maxwell’s equations before his contemporaries did. But the theory of relativity was revolutionary not because of Einstein’s genius, but because it represented a terrific avalanche in the fabric of ideas." Ubiquity by Mark Buchanan. In 2007, three years before he died, Mandelbrot and a former Wall Street Journal editor, Richard Hudson, published The Misbehavior of Markets: A Fractal View of Financial Turbulence​, which applied fractal mathematics to the financial markets. Nassim Taleb has called this book, "The deepest and most realistic finance book ever published." An abstract of the book may be found here and additional summaries here and a lengthier one here. In it Mandelbrot details the history and relationships between fractal geometry, power laws, natural systems and human-created systems, including Pareto's observations about the distribution of wealth in society (the so-called 80/20 rule) and why systems that assume a normality to markets are likely to fail catastrophically. "[T]o understand the aesthetic appeal of Pollock’s paintings, physicist Richard Taylor turned to the world of mathematics. He found that Pollock’s paintings, while seemingly haphazard, exhibit pleasing fractal patterns. 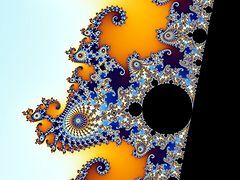 A fractal is “a geometric shape that can be separated into parts, each of which is a reduced-scale version of the whole.” In spite of the skeptical sneers, Taylor showed that fractal patterns are by no means an inevitable consequence of dripping paint. 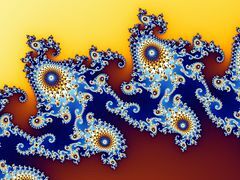 Fractals are ubiquitous in nature—trees, clouds, and coastlines are but a few examples—and as a result are visually familiar to humans. 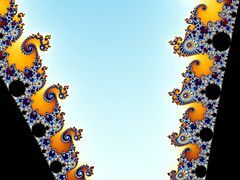 One critical feature of a fractal pattern is its fractal dimension—or degree of complexity (a line has a fractal dimension of 1.0, while a filled space has a dimension of 2.0). Taylor and his collaborators found that humans have a preference for fractals with dimensions between 1.3 and 1.5, whether those fractals are natural or human-made. Many of Pollock’s paintings fall within, or near, this range. As a consequence, scientists can quickly distinguish between a Pollock and non-Pollock. 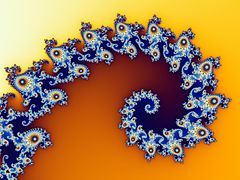 Because fractals are so common in nature, scientists often associate them with self-organized systems. Since economics deals largely with these types of systems, we might expect to see fractals in economic systems as well. And indeed, we do. Just as we have to analyze a Pollock painting or a coastline to appreciate the underlying fractal pattern, we must take a fresh look at economic systems as well. Order is often hidden." "Take species for a moment. Why are large carnivorous animals, like tigers, relatively rare, while small animals, like termites, are so abundant? Ecologists answer by pointing out that all animals have a niche—not just a physical location, but a real place in the grand scheme of things. A species must not only survive in its home; it must successfully interact with the other plant and animal species that share that home. The niche idea, though, still doesn’t explain why the distribution of species looks the way it does. That insight came from Oxford’s Charles Elton, who noted that larger animals need smaller animals to sustain them. (Animals rarely prey on larger animals.) So, Elton reasoned, with every increment in body size, there should be an associated loss in numbers. He called this fact of life the “Pyramid of Numbers.” Big fierce animals are rare because they have fewer sources of energy than smaller animals. The species power law distribution is a natural outcome of interacting animals constrained by the laws of physics." Philosophers and scientists now call this “intellect” Laplace’s demon. The notion that we can work out the past, present, and future through detailed calculations was, and remains, a very alluring concept precisely because it plays to our cause-and-effect bias. But complex adaptive systems do not accommodate such simple calculations. We can describe many complex systems as being in the state of self-organized criticality. “Self-organized” means that there is no leader. The system arises from the interaction of many underlying individuals. “Criticality” suggests nonlinearity. More specifically, the magnitude of a perturbation within the system (cause) is not always proportionate to its effect. Small perturbations can lead to large outcomes, and vice versa." Nassim Taleb, who might be deemed as a disciple or prophet of Mandelbrot, has also expanded on Mandelbrot's work in Fooled by Randomness, The Black Swan and Antifragile: Things that Gain from Disorder, and continues to author many papers and manuscripts in this area. Mark Buchanan followed up Ubiquity with a number of other works in this area, including recently Forecast: What Physics, Meteorology, and the Natural Sciences Can Teach Us About Economics. 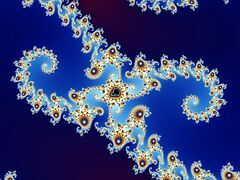 For more on the Fractal Lens and how it intersects with the Prospecting Lens and the Mimetic Lens, see the posts on Prospecting Fractals and Mimetic Fractals.